Can a Champagne Powder skiier find happiness in the New Hampshire Lakes Region? For years I skied the Champagne Powder of Steamboat Springs and the advice I gave to talented teenagers was that if they wish to compete on a larger stage they should plan on finishing high school at a ski town in the Northeast part of the country. Why? Edging techniques cant be taught in 2 feet of powder. When I myself finally relocated I picked the Lakes Region of New Hampshire partly because of the proximity of Gunstock Ski Resort. Though now I teach by appointment only I did spend a half dozen enjoyable seasons instructing there. For me Gunstock is an instructors dream and the most teachable mountain I have ever experienced. The secrets of Gunstock lie in the selective nature of the terrain slopes, the low number of mid-week skiers and the uniform consistency of the snow. Once over a period of 4 years a balance impaired skier from Florida, who maintained a second home on the Big Lake, and I worked together in 80 separate lessons that allowed him to become a capable intermediate skier. 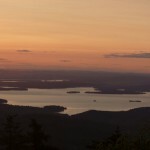 The views of Lake Winnipesaukee and its islands from the summit of Gunstock are stunning. This one was taken on at dawn from near the top of the mountain off the intermediate Gunsmoke run. Its no wonder that many of the second homes in the region are principally ski chalets for family and friends. I suggest you check Gunstock.com for this season's opening date.